Although the author of this composition chose not to name it, the main subject evokes the image of Snow White. Surrounded by the glowing beauty of a winter forest, the young princess appears to be quite at ease interacting with wild creatures. Three birds gathered around her sing out in joy while she gently moves tree branches aside. 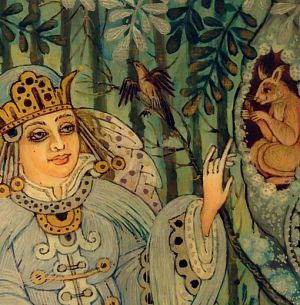 Her affectionate gaze falls on a friendly squirrel who, squatting inside the tree smiles back at the princess. The dominant colors in the composition are light blue, silver, and gold. The princesse's garments have subtle lilac undertones created by fine strokes. This stunning box is made from high quality papier mache. It stands on four small rectangular legs and each leg is decorated with a gold and silver ornament. An elaborate gold and silver ornament decorates the sides of the box. The bottom of the composition is signed with the names of the village and artist. The box has a hinge on the left and opens to a red interior. Lacquer is in excellent condition.